On April 6, hundreds of everyday heroes will conquer New England’s tallest building in support of children exposed to abuse and violence, while raising critical funds and awareness to support the CAC’s services. Will we see YOU at the top? Each April, the CAC kicks off child abuse awareness month with the Ginormous Climb! Climbing to the top of 200 Clarendon may not be easy, but it is worth it. Every step each climber takes reminds the hundreds of children who come to the CAC that they are not alone and that their community hears them and wants to help them heal. 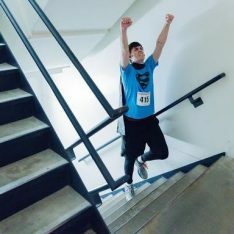 When you reach the top, you have conquered 1,200 stairs spanning 790 vertical feet, and helped make sure that every child who comes through the CAC's doors gets the support that they need. Register to climb, recruit your friends, and begin fundraising today by visiting www.ginormousclimb.com. Over the past 5 years, our climbers, sponsors, and volunteers have raised over $500,000 to support some of our community's most vulnerable members. We look forward to seeing you at the top again on April 6, 2019! (Photos from the 2018 Ginormous Climb are available here – don’t forget to tag your own pictures with #ginormousclimb when you share them!